I can recall many times of needing to present a vision for our church and not being all that sure which direction to go. Sometimes, perhaps most often, God leads us the way he led Abraham: "Go to a place I will show you." Those occasions require a kind of faith that must wait to see what God has planned. Conversely, there are moments like the present, when God provides vision to see his plans ahead. Moments like these require a different kind of faith, something more akin to courage to march into what God has revealed. The elders of The Painted Door believe God has given our church both that clear sort of vision and the faith to step into it. Specifically, we see a road ahead in which each member at our church would be invited into a directed plan of spiritual formation. We are in the process now of learning and training leaders in what practices and rhythms we can use for such direction. Broadly speaking, we want the members at our church to have the opportunity to dive deep into their stories and begin to understand how God is uniquely loving and forming each one of our souls. For many years, we have proclaimed the indiscriminate and free grace of God for all. Now, we sense urgency to learn and teach just how that grace is received. It is one thing to know that God loves us. It is quite another to experience his love, to have the fear and pain and shame of our stories baptized in his healing power. At our members meeting this Sunday, I'll speak more specifically about some of our plans. Please make every effort to be there. If you are interested in donating meals to families with a newborn, here are the latest meal train links to participate! This Sunday, Jan. 27, right after service, we’ll be having our most important members meeting of the year. We’ll be serving a tamale lunch. All members encouraged to attend. And non-members are welcome also. For those planning to participate in Financial Peace University next month, we’re postponing the class. We still hope to offer it sometime in the spring, so be on the lookout for that. 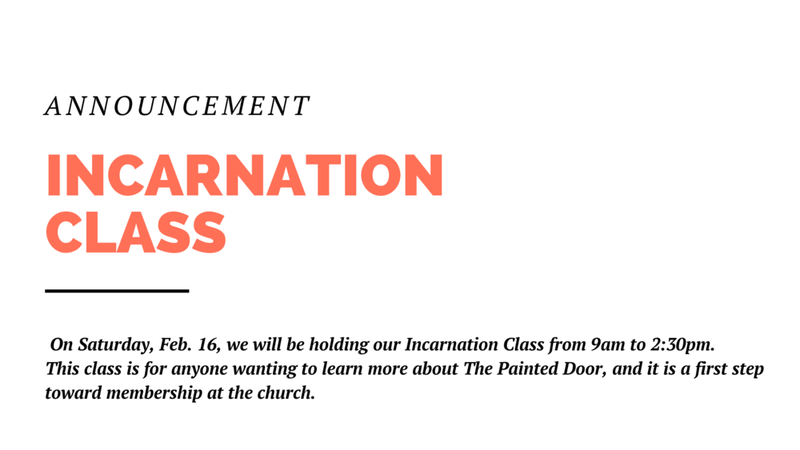 On Saturday, Feb. 16, we will be holding our Incarnation Class from 9am to 2:30pm. This class is for anyone wanting to learn more about The Painted Door. And it is a first step toward membership at the church. Breakfast and lunch are provided. Very few people know what they want. Yet what we want is always leading us. We are slaves to our desires. So then looking at our lives, how we spend our time, our money, our energy, gives us a glimpse into those desires. And often, the picture is not a pretty one. We tend to spend our time, our money, and our energy on self-promotion, self-satisfaction, self-protection. Turns out, what most of us want is just to feel pleasure and avoid pain. But there is something deeper in us. We were not made for such shallow living as to obsess over our personal little kingdoms. We were made to be swept up into a story far grander, into desires far richer. We were made for the adventure of love -- with all its pains and hardships. So how then do we loosen our grip on our shallow wants and dive deep into the epic of love? Simply: We receive it. God’s story of love is always knocking on the door of our little castles. He is always pouring out his love, in every relationship, in every circumstance. Look there, in that broken friendship, in that thankless job, in that ride on the bus, the epic of love is calling you. Go, run, leap into the life of God, This is what you were made for.